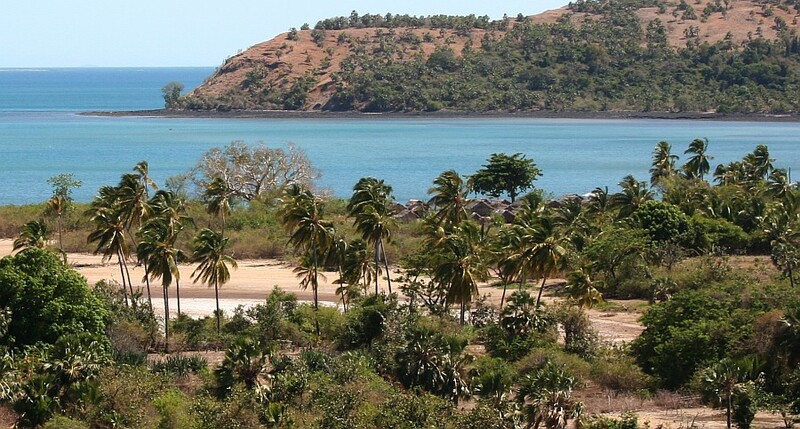 Madagascar's mountain ranges split the island into 3 distinct north-south zones. On the eastern side, swept by the wet southeasterly tradewinds, lie the island's primary rainforests. On the western coast, in the rain shadow of the hills, live plants better accustomed to semi-arid conditions. 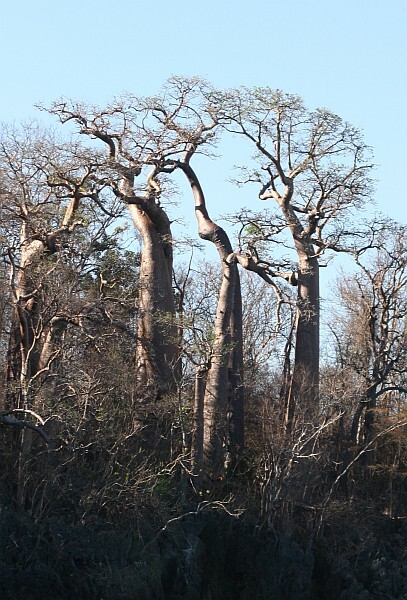 Here are found the forests of baobabs, denser forest of deciduous trees, and in the drier areas, the Dideriaceae family of plants that are structurally similar to the cacti of the Americas, but are in fact unrelated. 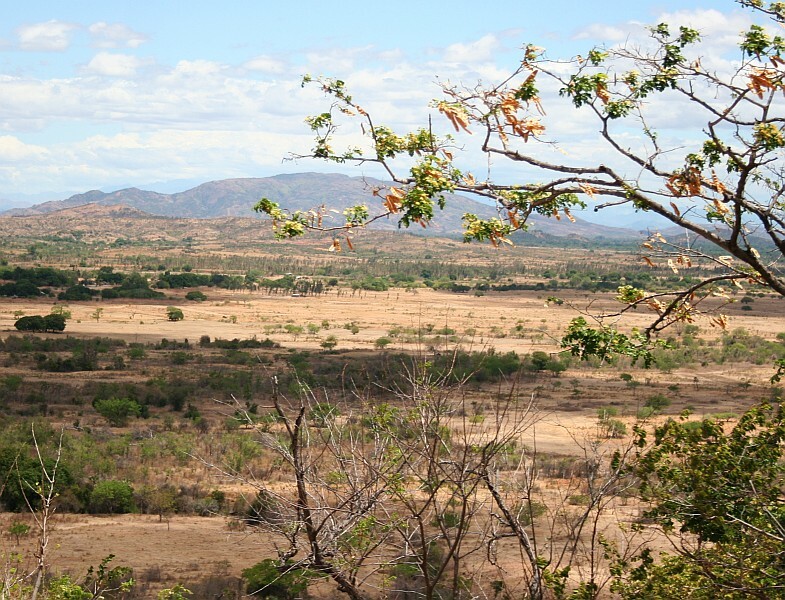 The third zone is the "haut plateaux" (French for high plateaus) which has been almost completely de-forested and is now either barren or home to agricultural efforts of the Malgasy peoples. 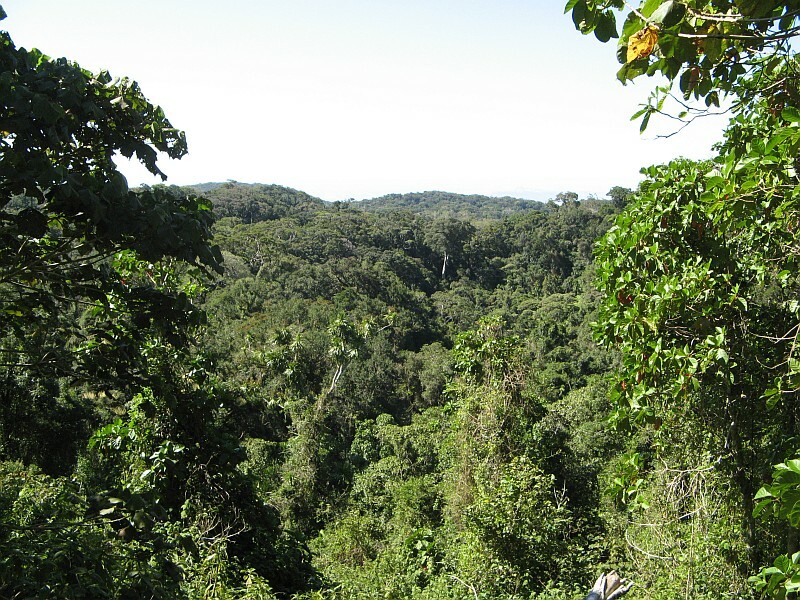 Although Madagascar is not on the world list of countries with mega-diversity in the plant realm, (they have about 12,000 species compared to 23,000 species in neighboring South Africa) they do have a very high percentage of endemic plants (i.e. 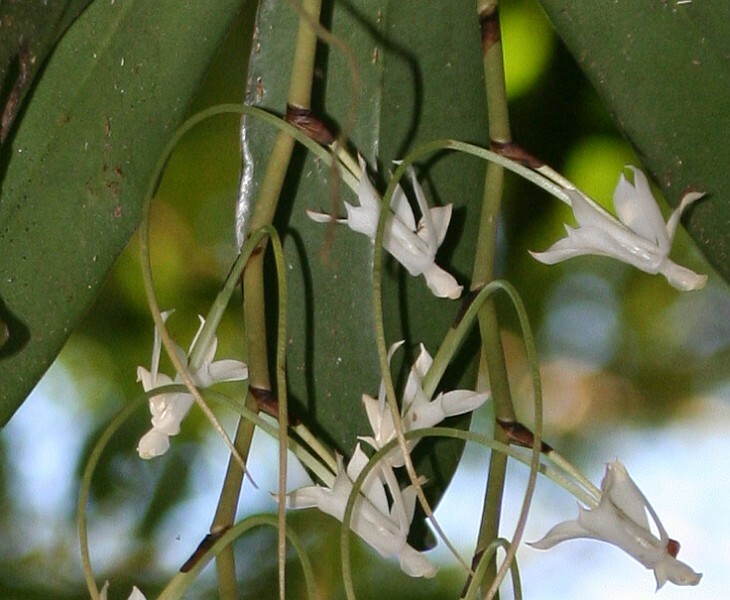 plants that occur only in Madagascar, and nowhere else). There are over 60 species of aloe growing in the semi-arid regions interspersed with the spiny desert plants. The awkward, upside-down looking baobab is a familiar shape for anyone who has been to southern Africa or read Antoine de Saint Exupery's "Le Petit Prince". 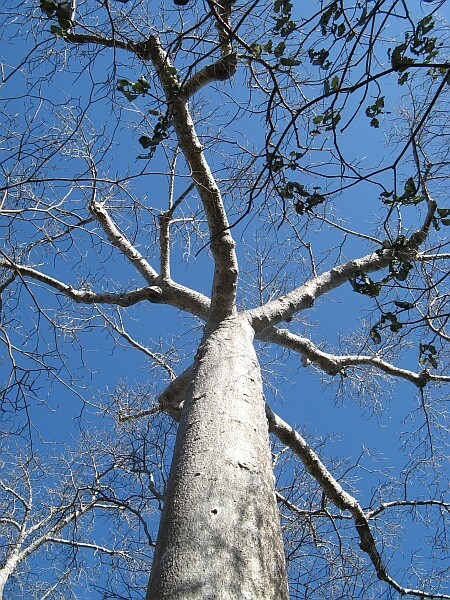 The one species found in mainland Africa is Adansonia digitata -- but Madagascar is home to 7 different species of baobab! Although we didn't get to travel much inland on the western or southern parts of Madagascar we were thrilled to anchor in Moramba Bay (on the west coast) where the strange karst islands were covered in baobabs. I don't know which species they were (and there may have been more than one) but they were great to look at! 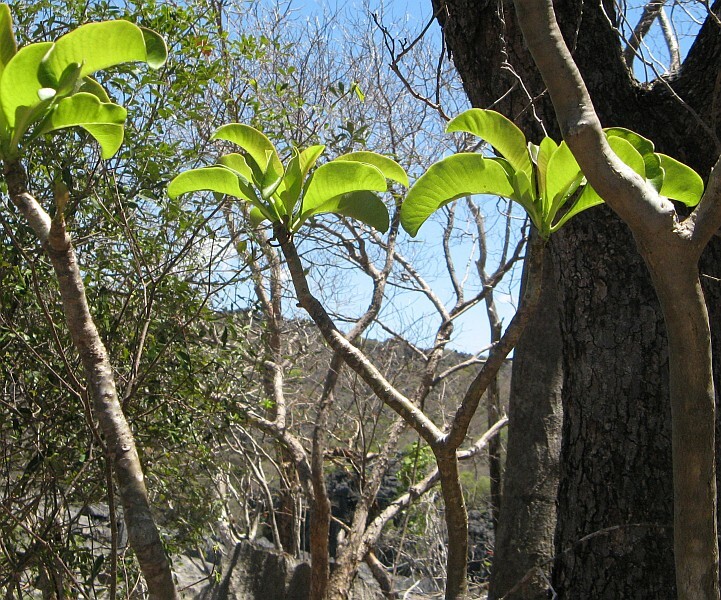 On the semi-arid west coast, some of the vegetation was familiar to us from other tropical islands. On Mitsio Island, north of Nosy Be we walked through a village and high onto the hills above the ocean. The paths were of red sand and dirt, and the bushes were thorny. Coconut palms and banana trees surrounded the thatch roofed houses. The people use the coconuts for many things, including fodder for animals, coconut meat for eating and/or drying for commercial purposes. 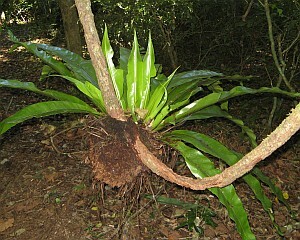 Other plants near the village included Screw Pine (Pandanus spp.) 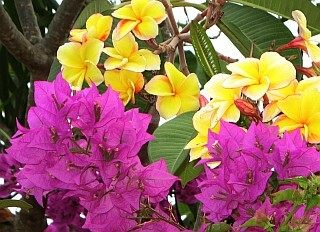 used for its wood and fiber, Indian Almond Terminalia catappa, Beach Morning Glory Ipomoea pescaprae, and Lantana Lantana camara (an invasive, introduced plant). 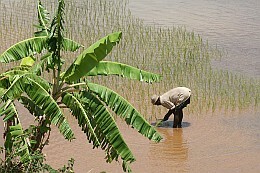 Food crops in such small villages also include Mangoes, Papaya and Bananas. 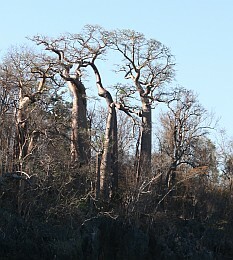 In northern Madagascar, in the Réserve Spéciale de l'Ankárana there were a variety of thorny shrubs, hardwood deciduous trees (in which the lemurs lived) and immense Ficus trees (left). Ubiquitous throughout the tropical world are these two colorful ornamentals: Bougainvillea Bougainvillea spectabilis (lavendar in this photo at right) and the fragrant Frangipani Plumeria spp. (here, yellow and pink). 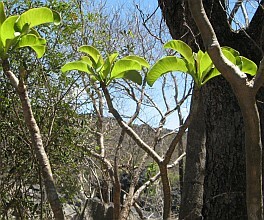 Although neither one is native to Madagascar, it seems that some early traveler or settler brought these New World plants to the Old World for decorative purposes. 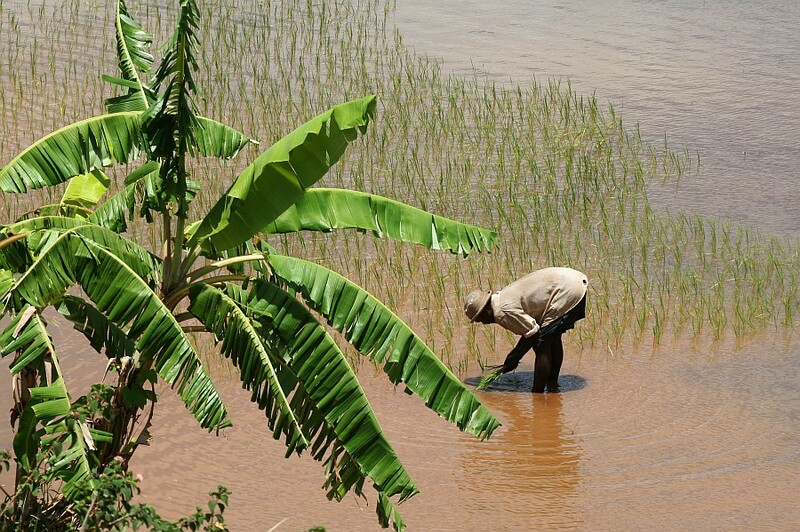 On the Haut Plateaux (High Plateau) of central Madagascar you see many rice paddies, here with a banana tree in the foreground. 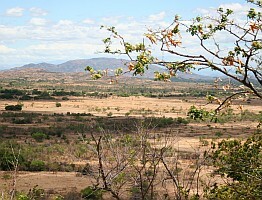 To the right, is a typical scene on the plateau, a few deciduous trees, then vast open areas long ago deforested and now eroding. One of the few plants able to withstand the dryness and heat of the limestone tsingy is the Elephant Foot Plant Pachypodium spp. 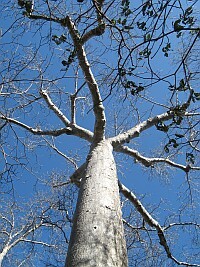 with its fleshy stems and rotund base (hence, "elephant foot"). It is found throughout the arid north, and has a large white flower. Verdant forest, dense with hardwood trees, characterizes the eastern and northern rainforest of Madagascar. 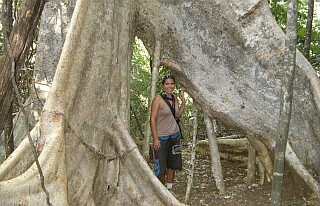 Here are found many species of lemur, chameleon and gecko, plus orchids, fungus and hundreds of plant species. The Birds Nest Epiphyte (right) is a common plant in the rainforest of Montagne d'Ambre, in northern Madagascar. Madagascar is home to hundreds of species of orchid. 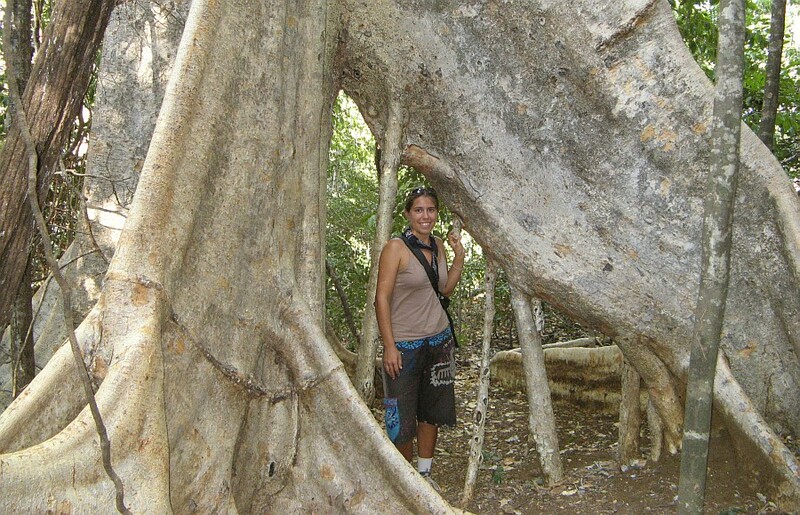 Many are epiphytic, meaning they grow on other plants, usually trees or tree branches, their roots in the air. 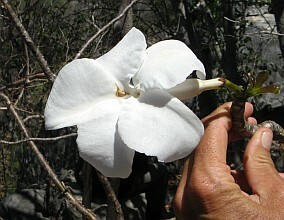 This specimen was blooming high on Montagne d'Ambre in October.